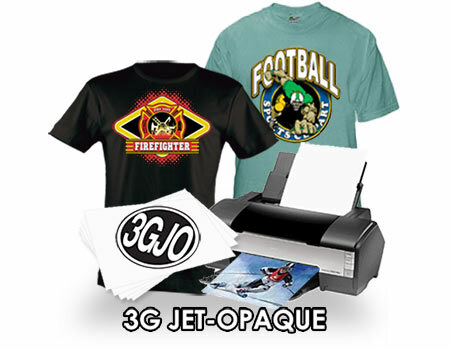 "3G JET-OPAQUE" (1 Step) Heat Transfer Paper For Dark Garment Printing in InkJet Printers. 3G JET-OPAQUE has a softer hand and drapes better on shirt. These Heat Transfer Papers are designed for transferring ink jet images to dark or other colored garments and substrates. The product contains an opaque layer to hide the color of the substrate and allow for photo-quality transfers. This product can be cut with a cutter/plotter, die and kiss-cut. Substrates include: T-shirts, sweatshirts, mouse pads, puzzles, and leather goods. Choose garments that have a tight weave. SEE SILICONE PARCHMENT PAPER BELOW! Can Be Applied With Home Iron But Does Not Have Optimum Wash Durability. A Heat Press Is Recommend!